Qantas Boeing 747-438 Reg. VH-OJT 'Fraser Island' on her last departure from Brisbane and from Australia as she leaves in the early evening for Los Angeles on her final passenger service to the USA before officially retiring after nearly 20 years of flying. Flight QF55 BNE-LAX 22 September 2018. 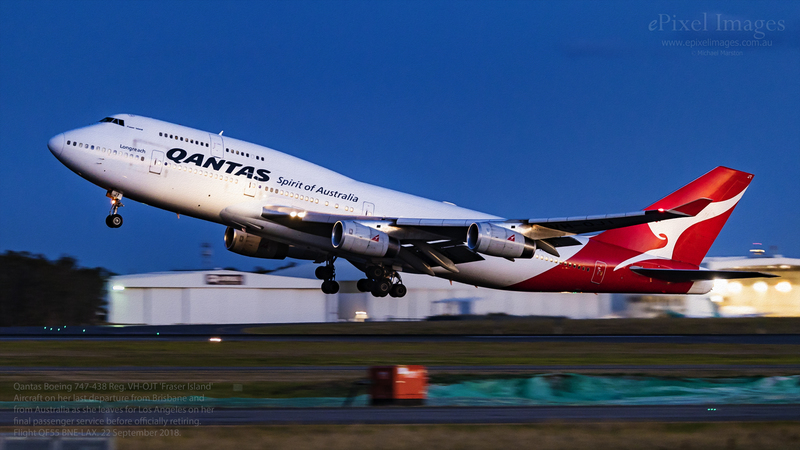 TedRcModels.Com Qantas is 747 fleet down to single digits after retirement of VH-OJT powered by Rolls Royce RB211 engines, was 50th delivered to Qantas.Leaves 747 fleet at nine acft-six GE-powered(VH-OEE thru OEJ)a single GE-powered 747-48E, and two RollsRoyce-engined 747-438's(VH-OJS and VH-OJU ) delivered in the 1999-2000 era.